This is the fifth entry in the 52 Ancestors in 52 Weeks challenge. The theme is Ploughing Through. I wonder how many researchers with Portuguese Hawaiian ancestry realize that their female ancestors were under contract, too? My great great grandmother was one of those women. 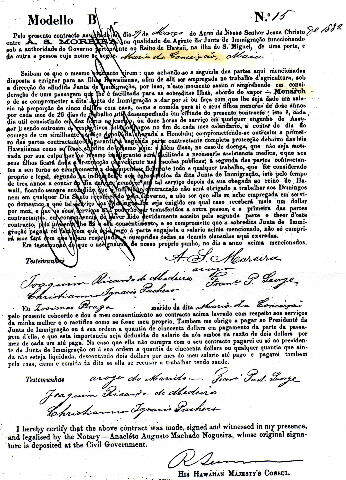 This is the original sugar plantation contract that my great great grandmother, Maria da Conceicao (de Mello) de Braga signed before leaving for Hawaii. The original has been in the hands of the Bonita descendants for many decades. The contract gives us some details about the sugar plantation system. 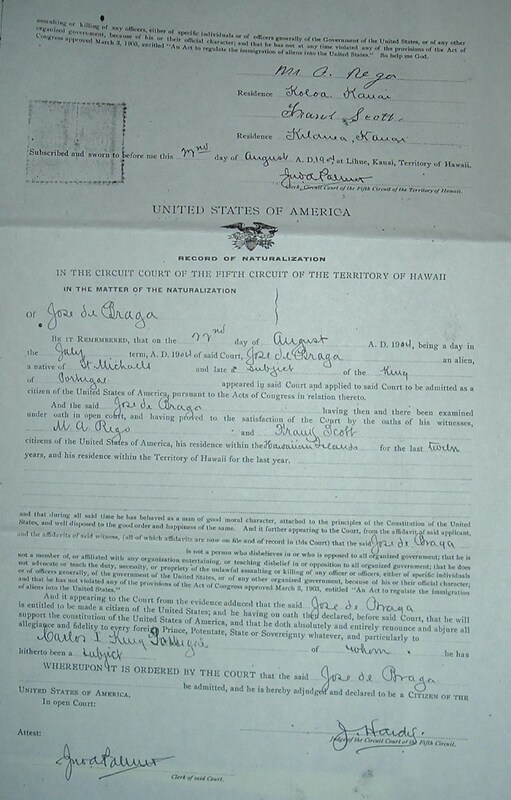 Maria and her husband, Jozima de Braga, would be on the ship the SS Monarch in 1882 with their children. It says that she would be employed as a laborer in agriculture. She would be given shelter, food, and medical care. Her children would get schooling, though agriculture work was also a part of their lives. Maria would work out in the cane field hoeing rows most likely. In exchange for working 10 hour days, 6 days a week, she earned $5 a month. Her husband, Jozimas, got $9 a month for similar work. Jozimas and Maria were sent over to the Kealia Sugar Plantation on Kauai. The work was difficult. Maria was 37 years old when she signed this contract. She also had 3 children to worry about who were ages 8, 6, and 3 years old. I wonder if she had help or took the youngest into the field with her (many women took their babies with them). Perhaps the older ones kept watch over the younger. The couple completed their contracts 19 Jun 1885. A 3 year stint. I am not sure how long they stayed on the Kealia plantation. They were living on the Kilauea Sugar Plantation by the 1890s. Maria’s health was fading. She died in 1903 in Kilauea at the age of 58. There are no photos of Maria that I know of. 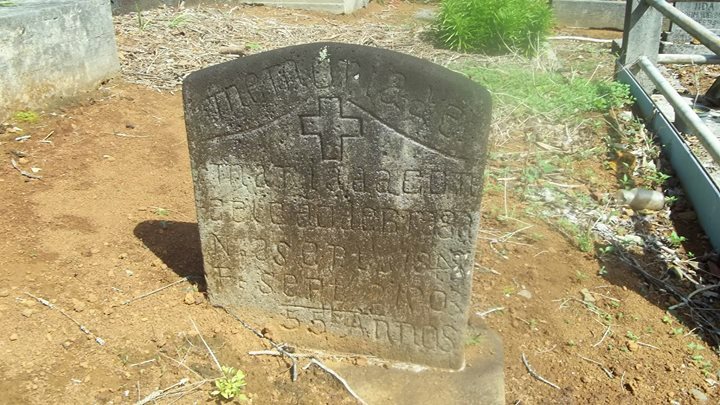 Her tombstone and the contract above are the only records of her small contribution to Hawaii’s sugar plantation history. Just discovered your blog today and will be following via a feedly reader. I have just started to look into my mom’s Azores roots. She was born in St Amaro, Velas, Sao Jorge. My grand father was Abel de Sousa Freitas (I have lost cousins in Cal.) My grandmother was Maria Silveira Borges. I enjoy poking around different sites looking clues and ideas.